Appleton, WI has been home to professional baseball since 1891. A lot has changed since then, however, more than 100 years later one thing has remained the same. Appleton still offers lifetime memories and affordable fun through America's pastime...baseball. 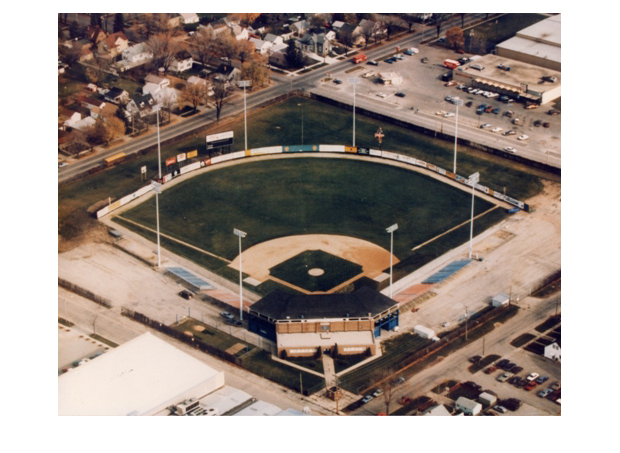 In 1994, management and the board of the directors for the then Appleton Foxes determined that a new stadium had to be built or they would risk losing professional baseball in the Fox Valley. Goodland field, built in 1940, needed a million dollars in repairs and updates to bring it up to the standards of Minor League Baseball nationally. Even then, there was no guarantee that sagging attendance figures would rebound. A new, modern facility was the only answer. A prime location just off the major artery through Northeast Wisconsin (Hwy. 41) was secured along with the $5 million in funding necessary for construction. The 5,500 seat Fox Cities Stadium became a reality with updated amenities for both players and fans. Fox Cities Stadium is owned by the Fox Cities Sports Authority, a non-profit organization dedicated to enhancing athletics in the Fox Cities area. At the same time, a local marketing firm was enlisted to help develop a new identity for the team. Several names were considered, and a survey was done of area school kids to determine popularity. The result, Wisconsin Timber Rattlers, had a broader appeal and an updated image. The new logo shot to #1 overnight, and Rattlers caps are still among the most popular nationally. The Timber Rattlers are a non-stock, community-owned team similar in structure to the Green Bay Packers organization. Timber Rattlers' membership shares are available by contacting the front office. Shareholders, while not owners per se, enjoy the right to participate and vote at the team's annual meeting. The gamble paid off, and the combination of a new logo, a new stadium and better location resulted in nearly tripling attendance. The Foxes drew just over 76,000 in 1994. The Timber Rattlers drew over 209,000 to Fox Cities Stadium in 1995. Four local businessman post a $200 bond to enter Appleton in the six-team Wisconsin State League. They played the first game on May 23, before a crowd of nearly 500. The league folded at season end; Appleton boasts a 48-41 record. Local investors purchase the Wausau franchise in the Wisconsin-Illinois League. They name the team the Papermakers. Other teams in the league include the La Crosse Pinks, Green Bay Tigers, Wausau Lumberjacks, Fond du Lac Cubs, and the Freeport (IL) Pretzels. The Papermakers win the Wisconsin-Illinois League with a 74-45 record. Ike McAuley hits .344 to lead the league and Mike Murphy goes 32-6 on the mound. The Oshkosh Indians win the league championship as Appleton's Harry Sylvester tops the circuit with a .355 average. In the last season of the Wisconsin-Illinois League, Oshkosh won their third straight title. Appleton finished the season with a 64-58 mark, good for third place. Harry Smith went 17-3 for the Papermakers. Baseball returns to Appleton with the formation of the Wisconsin State League. The team - still called the Papermakers - is an affiliate of the Cleveland Indians. They played in Appleton's brand-new Spencer Street Athletic Field (soon to be renamed Goodland Field). The Papermakers make the playoffs with a 65-44 record, good for third place. They are swept in the playoffs by the Green Bay Blue Sox. Pat Seerey's 31 HR and 117 RBI lead the league. Another playoff appearance is cut short by Green Bay, now nicknamed the Bluejays. After suspension during World War II, the Wisconsin State League starts up again. A revived Papermakers team again takes the field, through 1953. The team is affiliated successively with the Philadelphia Phillies, St. Louis Browns, and the Boston/Milwaukee Braves. 80,381 fans come to see the Papermakers, tops in the Wisconsin State League. The team finishes a disappointing 58-66, 7th place in the 8 team league. The Papermakers again lead the league in attendance by drawing 71,999 fans. Appleton goes 43-77 in the final year of the Wisconsin State League. Professional baseball returns to Appleton for the 5th and final time. The team - now called the Foxes - is affiliated with the Washington Senators and is a member of the Three I League. The team draws over 58,000 fans in its first year. Carlos Pascual leads the lead with a .372 average. Jack McKeon manages the Foxes to a 59-67 record as Hernan Vila hits .330 to take the batting title. After two seasons with the Senators, the Foxes become a Baltimore Orioles affiliate. Earl Weaver led the Foxes to a 82-59 record and the Three I League Championship. Boog Powell (.312, 100 RBI) and Pete Ward (.345, League MVP) power the offense. With the collapse of the Three I League, the Foxes join the Midwest League. Cal Ripken Sr. earns Manager of the Year. The Fox Cities Foxes claim their first Midwest League Championship, going 81-43 and defeating the Clinton C-Sox in a one game playoff. Dave May hits .368, tops in the Midwest League. The Foxes change their affiliation to the Chicago White Sox, where it remains until the end of the 1986 season. The Foxes are the league champions, with a 77-47 record. Deacon Jones finishes with the top batting average (.353) and RBI total (80) in the Midwest League. Fred Rath wins 17 games and Mickey Abarbanel strikes out 206, both league tops. Ed Holtz wins the Midwest League Executive of the Year Award. The Fox Cities Foxes become the Appleton Foxes, but the results are the same on the field, as they again capture the Midwest League Championship. The Foxes went 71-46 in the regular season and then sweep the Wisconsin Rapids Twins in the playoffs. Alex Cosmidis is awarded the Midwest League Manager of the Year and Holtz repeats as Executive of the Year. Appleton wins both halves of the Midwest League season, earning the Championship without having to play the playoffs. There composite record is 84-41, 11 games better than the second place Clinton Pilots. Don Eddy leads the league in wins (18), and ERA (1.81), while teammate Bart Johnson tops the circuit strikeouts with 200. Tom Saffell is selected as Midwest League Manager of the Year and Ed Holtz is chosen as Executive of the Year. After finishing the regular season with the league's best record at 79-44, the Foxes are defeated by the Quad Cities Angels in the Midwest League Championship Series. Lamar Johnson's 97 RBI lead the league. Rich "Goose" Gossage had a dominating season, going 18-2, throwing 15 complete games (7 of them shutouts) with a 1.83 ERA. Joe Sparks wins Midwest League Manager of the Year. Ed Holtz wins his third consecutive, and fifth overall, Midwest League Executive of the Year Award and also is the Class A Executive of the Year. The Foxes again have the best record in the league (76-51), but once again fall short in the playoffs. After defeating Wisconsin Rapids in the first round, they fall to the Danville Warriors in the Championship. Lamar Johnson tops the league in both RBI (89) and HR (20). The Foxes draw an all-time record 94,730 fans, while compiling a 97-40 record and again winning the league championship. Curtis Etchandy hit 17 homers and Harry Chappas hit .302 to lead the offense. LaMarr Hoyt, Michael Sivik, Jackie Smith, and Dewey Robinson all won at least ten games. The team is ranked by MiLB.com as one of the top 100 teams in Minor League History. Gordy Lund wins Midwest League Co-Manager of the Year and Dave Hirsh is selected as the Executive of the Year for both the Midwest League and all of Class A baseball. Kevin Hickey pitched four complete games, struck out 100 batters, and compiled a 3.57 ERA, but only went 5-10 for a Foxes team that finished the season 63-72. Greg Walker (.280, 21 HR, league leading 98 RBI), Tim Hulett (.259, 13 HR, 47 RBI), and Ron Kittle (.316, 12 HR, 56 RBI) led the Foxes to a 76-63 record, but they failed to make the playoffs under manager Gordy Lund, making his third stop with the Foxes. The Foxes struggled to a 54-80 record, finishing last in the Midwest League Northern Division. After finishing the regular season with the Northern Division's second best record (81-59), the Foxes made the playoffs as a Wild Card and defeated the Springfield Cardinals and Madison Muskies to win the Midwest League Championship. Daryl Boston, the White Sox first round pick in the 1981 draft, hit .279 with 15 homers and 77 RBI. On the mound, Mike Tanzi went 14-6 with an ERA of 2.22 and 12 complete games. 81,970 fans came out to Goodland Field to see the Foxes play. Manager John Boles led the Foxes to the best record in the league (87-50), as well as their second straight Midwest League Championship. Ron Karkovice hit 13 homers, Kenny Williams slugged 12, and John Cangelosi hit .287 and stole 87 bases. Mike Trujillo won 15 games, Rich DiVincenzo won a Midwest league best 18, and Al Jones saved 22 games while going 11-1 with a 0.97 ERA. The Foxes win the league championship for the third consecutive season after compiling a 87-49 record in the regular season, but draw only 54,281 fans. Russ Morman was the offensive leader, hitting .262 with 17 doubles, 7 triples, 7 homers, and 80 RBI. Former Foxes star Britt Burns returns to Appleton and pitches 5 innings on a rehabilitation outing. For the third consecutive season, the Foxes finish with best record in the Midwest League, but they failed to win their fourth straight Championship, losing the Kenosha Twins in the first round of the playoffs. OF Jim Winters leads the league with 91 RBI. The Foxes run among the league elite ends with a 56-83 season. Randy Velarde leads the team with 31 doubles and 50 RBI. After 21 seasons with the White Sox, the Foxes begin their Major League affiliation with the Kansas City Royals by going 71-69. Outfielder Kenny Jackson hits 19 home runs and drives in 67 runs. Mike Butcher goes 10-4 with a 2.67 ERA. Built with a lot of speed (5 players with 20+ stolen bases), but little pop (40 total home runs), the Foxes struggled to a 58-82 record. Terry Shumpert led the team in doubles (37), homers (7), and stolen bases (37). Tom Gordon was dominant on the mound, striking out 172 batters in 118 innings to go with a 2.06 ERA. He was named the Midwest League Prospect of the Year. Goodland Field draws 76,223 fans to see the Foxes go 67-68. Mike Parnell saves 28 games with a 2.01 ERA and Greg Harvey wins 13 games. Post Season All Star 1B Rich Tunison hits .300 with 21 doubles, 6 triples , 8 homers, 86 RBI, and steals 32 bases while OF Kerwin Moore steals 57 bases and leads the league with 93 runs scored, but the Foxes finish in the middle of the pack, going 62-71. After an okay first half of the season (33-36), the wheels fell off in the second half, finishing a league worst 25-45. For the first time since 1985, the Foxes make the playoffs, winning the first half title by 5 games, going 41-23. Kettle Moraine, WI native Joe Randa spends 72 games with the Foxes, hitting .301 and earning a promotion to Baseball City. Tom Poquette is selected Midwest League Manager of the Year and SS Shane Halter (.265, 22 2B, 21 SB) makes the Post Season All Star Team. The Foxes begin their Major League affiliation with the Seattle Mariners. The team fails to make the playoffs, finishing with a 62-73 record. Tim Davis goes 10-2 with a 1.85 ERA in 77.2 innings, striking out 89 batters and earned a spot on the Post Season All Star Team. 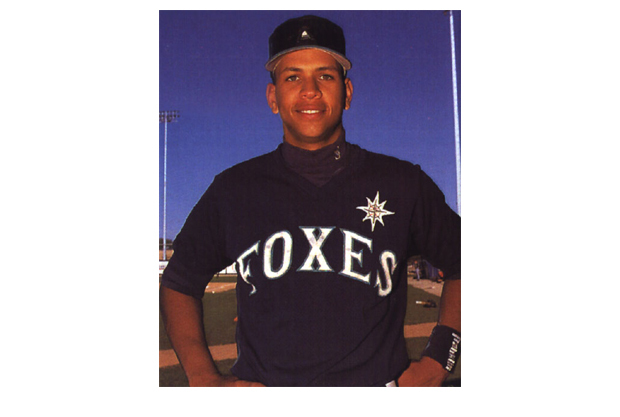 The number one overall pick in the 1993 draft, Alex Rodriguez, makes his professional debut with the Foxes. He hits .319 with 17 2B, 14 HR, and 55 RBI in 65 games before his promotion to Double-A Jacksonville. C Raul Ibanez hits .312 with 30 doubles and Matt Mantei saved 26 games and they finished 75-64, but just missed making the playoffs. The Foxes play their last game in Goodland Field, drawing over 76,000 fans during the season. Following the end of the season, the team changes its name to the Wisconsin Timber Rattlers. The Wisconsin Timber Rattlers open the season in new, privately financed Fox Cities Stadium. The $5 million stadium seats 5,500, and the team draws 209,159. The team is led on the mound by Ken Cloude. The Timber Rattlers host both the Midwest League All-Star Game and an exhibition game with their parent club, the Seattle Mariners. The Rattlers draw 233,797 in their second season. The team goes to the playoffs, only to lose in the final game of the Championship Series. The Timber Rattlers received the Bob Freitas Award as the top Class 'A' franchise in the Minor Leagues. David Arias (now know as David Ortiz) leads the Timber Rattlers in hits (156), runs (89), home runs (18), and RBI's (93). Kevin Gryboski had the second most wins (10) and strikeouts (100). Timber Rattlers pitchers break the ten-year-old Midwest League record for strikeouts in a season with 1220. Manager Gary Varsho leads the team to the playoffs again. Denny Stark led the pitching staff with an ERA of 1.97. Stark struck out 105 hitters and walked only 33. Joe Mays and Adonis Harrison also had standout seasons. First round draft picks Gil Meche (1996) and Ryan Anderson (1997) headed a pitching staff that once again broke the Midwest League strikeout record with 1274. Joel Pineiro led the starting pitchers with an ERA of 3.19. Jermaine Clark was the top hitter for the Rattlers. For the third season in a row, the Rattlers advanced to the playoffs. Mike Birling wins the Midwest League Executive of the Year Award. The Timber Rattlers celebrated their fifth year and welcomed their one-millionth fan. The Wisconsin Timber Rattler organization once again received the Midwest League "Playing Field" and "Groundskeeper of the Year" awards. The Wisconsin Timber Rattlers won the second half of the season and went on to the championship round and were defeated in the final game by the Burlington Bees. Attendance - 223,814. Juan Silvestreset the record mark of 21 homeruns for the Timber Rattlers and Bo Robinson led the team in hitting .329. Chris Mears went 10-1 on the mound. The Wisconsin Timber Rattlers came within one game of the Midwest League Championship Series. J.J. Putz led the club with 12 and in 2003 made his big-league debut as a member of the Mariners, joining Rafael Soriano (8-4, 2.87 ERA) and Julio Mateo (4-8, 4.19) in Seattle. Before his 2003 rookie campaign Toronto Blue Jays, Aquilino Lopez went 6-1 with a dazzling 1.85 ERA adding 17 saves. Craig Anderson (11-8, 3.71 ERA) and Cha Seung Baek (8-5, 3.95) also threw strong for manager Gary Thurman. Chris Snelling joined Ryan Christianson and Justin Leone in the high power Rattlers offense. Chris Snelling and Craig Anderson were selected to represent their country of Australia in the 2000 Sydney Olympics. Fox Cities Stadium now features a new covered picnic deck. The Wisconsin Timber Rattlers came out on top of the Second Half Western Division to earn a playoff berth, only to lose in the second round to the Midwest League Champion Kane County Cougars.Wisconsin's success was well balanced with a team ERA of 2.96 and team batting average of .271. Clint Nageotte led the MWL with 187 strikeouts, Kevin Olore won 13 games, and Derrick Van Dusen threw the first nine-inning complete game shut out in Timber Rattler history on August 27 at Cedar Rapids. Jamie Bubela who led the MWL with 161 hits and 12 triples, Pedro Liriano, Jamal Strong, and John Castellano led a potent Rattlers offense. On April 29th the Timber Rattlers played host to the Seattle Mariners led by 2001 American League Rookie of the Year and MVP Ichiro Suzuki. Shin-Soo Choo appeared in the All-Star Futures game, had his own Timber Rattlers bobble-head, led the club in hitting over .300, and had a slugging percentage of .440. Rattler third baseman Greg Dobbs staring alongside Choo in the Midwest League All-Star game and had a slugging percentage of .431. It was a record setting season for a few members of this Rattler team. Matt Hagentied the single season home run record of Juan Silvestre with twenty-one homers. Bobby Livingston became the single season record holder for wins with fifteen victories on the season. TA Fulmer set a new single season earned run average record of 2.58. The Timber Rattlers, lead by manager Daren Brown, qualified for the playoffs as the First Half Western Division Wild Card thanks to winning streaks of seven, eight, and nine games. Plus, the Rattlers won their last eleven home games of the half. On July 25th, a single game record crowd of 7,722 saw the Rattlers defeat the Cedar Rapids Kernels 9-7. Just under a month later, on August 14th, the Rattlers fell to the Beloit Snappers at Miller Park in Milwaukee before a short-lived Midwest League record crowd of 14,447. Wisconsin finished the regular season with a record of 69-66 before being swept in the first round of the playoffs by the Snappers. The Wisconsin Timber Rattlers missed the playoffs for the second time in three seasons with an overall record of 57-82. Steve Roadcap, who led Wisconsin to the Midwest League Championship series in 1999, returned for his second tour of duty as the club's manager. The Rattlers finished the first half 31-38, but were in the second half playoff race with just over a month to go in the season. On August 10, the team was 22-23 and within striking distance of either of the two playoff spots. However, Wisconsin went 4-20 in their final twenty-four games to miss out on the post-season for just the third time in its history. There were memorable individual performances. Tom Oldham struck out fifteen Dayton Dragons on June 28 over eight shutout innings. Oldham allowed four hits in a Rattler win. A few days later, July 2nd, Brandon Moorhead nearly matched Oldham's strikeout total. Moorhead recorded fourteen K's against the Cedar Rapids Kernels while also walking one and allowing four hits over eight shutout innings. Oldham (7/12-7/18) and Jason Mackintosh (7/26-8/1) each garnered MWL Pitcher of the Week honors once. Moorhead finished fourth in the league in strikeouts with 163 and Oldham was sixth in the league in ERA with a 2.93. On July 31, Adam Jones - one day before his nineteenth birthday - hit a pair of home runs and drove in five runs at Battle Creek. Wladimir Balentien, who played for the Dutch national team at the 2004 Athens Olympics, also had a two homer, five RBI game for the Rattlers. Balentien was the only Rattler to receive Midwest League Batter of the Week honors - and he picked up that award twice in 2004. Balentien was named Batter of the Week on May 23 rd and July 5th. A few members of the 2004 Rattler squad etched their name in the Rattler record book. Mike Hrynio set a Timber Rattler record for appearances by a reliever with his fifty-four appearances. Brian Stitt earned sixteen saves to move into fourth place on the single season list. Moorhead and Mackintosh reached the top ten on the strikeout list. Moorhead finished the season with 163 punchouts good for third on the Rattler top ten behind only Clint Nageotte (187 in 2001) and Gil Meche (168 in 1998). Mackintosh finished tenth with 139 K's on the season. Cox became just the second Rattler to have two slams in a season. For the second year in a row, the Rattlers took on their in-state rival Beloit Snappers at Miller Park in Milwaukee for the Battle of Wisconsin. And for the second year in a row, the Snappers came away with the trophy. Beloit beat the Rattlers 5-0 on August 12. The team's biggest comeback was on August 3 against Clinton at Fox Cities Stadium. The Rattlers trailed Clinton 7-1 heading into the bottom of the eighth inning at Fox Cities Stadium. Wisconsin put three runs on the board and loaded the bases. Michael Cox hit a grand slam to put the Rattlers up 8-7 and the bullpen held on for the win. Several former Timber Rattlers showed up at Safeco Field for their first time with the Seattle Mariners. Scott Atchison ('99), Cha-Seung Baek ('00), Greg Dobbs ('02), Justin Leone ('00), Rene Rivera ('03), and Matt Thornton ('00) all put on a Mariner uniform in the 2004 regular season. The 2005 season was a bounce-back year for the Rattlers. Under first year manager Scott Steinmann, the Rattlers made it all the way to the Midwest League Championship Series against the South Bend Silver Hawks. Wisconsin lost the first two games at South Bend in the best-of-five series, but won the next two games at Fox Cities Stadium. Game Five was scoreless until the Hawks scored three runs in the seventh inning. South Bend won the game 4-0 and the Rattlers came up just shy of their first Midwest League Championship. But, 2005 will be remembered more for how the team played during the season than for the way the season ended. Wisconsin started out the season red-hot, winning seven of their first eight games. During this early run, Matt Tuiasosopo hit a game winning homer in the bottom of the eleventh inning against the Swing of the Quad Cities. It was the first "walk-off" homer by a Rattler since 2003. The Rattlers rode that hot start to a 39-31 record and a first half Western Division Championship. On the basis of that first place finish, Steinmann got to manage seven Timber Rattler players - as well as the rest of the Western Division team at the Midwest League All-Star game in Peoria, Illinois on June 21. The West lost the game 4-2. The second half of the season started off slowly for the Rattlers because of the promotions of key players, but an 18-11 record in the month of July had the team on another roll. One of the big games in the month of July was a stunning comeback in Peoria on July 11. The Rattlers trailed 11-2 going into the top of the sixth. Wisconsin rallied to beat the Chiefs 12-11 in ten innings. In August, the team got a big bat for their drive to the end of the season. Catcher Jeff Clement, the third pick in the 2005 draft, joined the team. Clement been selected by Mariners off the University of Southern California campus and sent to the Rattlers where he complemented established Rattler hitters like Marshall Hubbard, Yung Chi-Chen, Brent Johnson, Oswaldo Navarro, Tuiasosopo, and Mike Wilson. The Rattlers finished the second half atop the Western Division standings with a 37-32 record. Wisconsin finished 2005 with a 76-63 overall record, the second best record in the league. It looked like the Rattlers post-season run would end early. The Beloit Snappers won Game One of a best-of-three first round playoff series. Wisconsin came back with a 9-1 win in Game Two to force a decisive Game Three. Wilson stepped to the plate with the game tied 2-2 and a runner at first in the bottom of the tenth inning and crushed a series winning home run that sent the Rattlers on to the Western Division Finals. In that series against Clinton, the Rattlers rallied from a 7-3 deficit to win Game One 8-7 in ten innings. Chris Colton tied the game with a home run in the top of the ninth. Clement provided the winning margin with a homer in the top of the tenth. The next night at Wisconsin, the Rattlers cruised to a 16-0 victory over the LumberKings and claimed a spot in the Championship Series for the third time in team history. Two former Rattler players made their major league debuts in 2005. Outfielder Shin-Soo Choo ('02) and pitcher Felix Hernandez ('03) each made it to The Show as Seattle Mariners. After a spectacular 2005 season, the Timber Rattlers stumbled in '06 under new manager, and former Timber Rattlers catcher, Jim Horner. The club went 54-86 for the season, finishing in seventh place in the Western Division for both halves. The offense was led by 2B Luis Valbuena (.286, 16 2B, 21 SB) and 3B Ron Garth (.275, 22 2B, 10 HR). Only one Rattlers starter ended with a winning record, Nick Allen (7-4), but there were some fine performances in the bullpen, including Joe Woerman (2-2, 7 Sv, 2.12 ERA, 54K in 34 IP), Austin Bibens-Dirkx (2-2, 4 Sv, 1.95 ERA) and Brian Kappel (4-0, 8 Sv, 1.61 ERA). The Timber Rattlers again had a rough year on the field, finishing up with the worst record in the Midwest League at 53-85. The team once again had a youthful international flavor, with 21 year old Kuo Hui Lo (.288, 21 2B, 7 3B, 32 SB) from Korea, 18 year old Alex Liddi (.240, 28 2B, 52 RBI) from Italy, and 17 year old Carlos Triunfel (.309) from the Domincan Republic all making major contributions to the offense. The Mariners sent two rehab assignments to the Rattlers, Sean White and former Rattlers pitcher Cha Seung Baek. The Mariners 2006 2nd and 3rd round draft picks, RHP Chris Tillman, and LHP Tony Butler, an Oak Creek, WI native, started the season in Appleton. Andrew Barb (3-1, 10 Sv, 2.33 ERA) and Joe Kantakevich (3-4, 2.55 ERA) represented the Rattlers at the All Star Game hosted by the Kane County Cougars. The Miller High Life Home Run Porch was added behind the right field wall. Field naming rights were sold, with the new name being Time Warner Cable Field at Fox Cities Stadium. Team President Rob Zerjav is awarded the Midwest League Executive of the Year Award. The Rattlers missed out on the playoffs for the third season in a row as they went 56-80. Edward Paredes just missed out on some history at Cedar Rapids on May 21 as he tossed 7-2/3 innings without allowing a hit. Wisconsin would beat the Kernels 1-0 in the game. Second baseman Edilio Colina was the starter for the Western Division at the Midwest League All-Star Game in Great Lakes where he was joined by fellow infielder Juan Diaz and reliever Travis Mortimore. In the final game of the season, Michael Pineda struck out 14 Quad Cities River Bandits, did not walk a batter, and allowed only an infield single over a 9-inning complete game. That September 1, 2008 game also marked the end of an era, as it was the final year of the partnership between Appleton professional baseball and the Seattle Mariners. The Rattlers started a new phase of construction at Neuroscience Group Field at Fox Cities Stadium before the start of the season. The original matrix scoreboard was replaced by a state-of-the-art video scoreboard to enhance the game experience for fans. The first season of the affiliation between the Rattlers and the Milwaukee Brewers was memorable for many reasons. Notably, it started on Opening Night as the team drew its first ever sellout for the first home game of the year. The Rattlers topped Quad Cities 2-1 with 5,487 at the game. The team went on to set a new single season attendance record of 253,240. Wisconsin returned to Miller Park, but - unlike 2003 and 2004 - this time they were the home team. The Rattlers beat Peoria 5-3 at Miller Park on April 24 thanks to a Brock Kjeldgaard home run in front of 17,880 fans. Kjeldgaard made a run at the franchise home run record with 20 long balls on the season, just one homer shy of the record held by Juan Silvestre and Matt Hagen. The team was well-represented at the 2009 Midwest League All-Star Game in Clinton. Pitchers Daniel Meadows, Wily Peralta, and Jim Henderson were joined by second baseman Brett Lawrie and catcher Corey Kemp. Jeff Suppan and Dave Bush both made rehab starts in front of a packed house each time they pitched in a Rattlers home jersey. But, the Rattlers streak of missing the playoffs reached four seasons as they finished 58-81 on the year. The success at the gates allowed Appleton professional baseball to make improvements to Neuroscience Group Field at Fox Cities Stadium. The bullpens were moved beyond the outfield fence. New seating for box seats and patio tables filled in the old bullpen location on the third base side. A brand new 'All You Can Eat' area with bartop seating took over for the old first base bullpen area. A general admission spot was added (as a beach) beyond the outfield fence in right center. The team also added a boardwalk that allows fans to walk out to the bullpens. The team played another game at Miller Park, but lost 6-1 to the Kernels on May 7 with 12,667 looking on. Outfielder Khris Davis put on a power display that lasted the entire season. He won the Midwest League Home Run Derby in Fort Wayne during the All-Star Break. Davis also hit 22 home runs on the season, breaking the single season home run record that had stood since 1999. Davis was joined by Scooter Gennett in the starting lineup for the Western Division at the All-Star Game. Nick Bucci and Jake Odorizzi also were on the West squad. Odorizzi and Adrian Rosario combined on a no-hitter at Cedar Rapids on August 24. Odorizzi tossed the first eight innings and struck out 10 Kernels batters, but his pitch count was too high and Rosario entered the game for the bottom of the ninth. Rosario retired the side in order to give Wisconsin the first combined no-hitter in team history and the first no-hitter for the team since 2001. The Rattlers received several rehab starts from big leaguers during 2010. Jeff Suppan was the Opening Night starter for Wisconsin. Pitcher Doug Davis and outfielder Carlos Gomez also made the trip to the Midwest League to work their way back to the majors. Even with all of the individual achievements, the Rattlers missed out on the playoffs again in 2010 with their fifth straight season with 80 or more losses (58-80). Yet, the fans kept coming out to the ballpark. The Rattlers pulled in 244,331 to 65 home dates in 2010. That was just shy of the single season total attendance record, but the team did make a record for average attendance during the season with 3,759. Appleton native Matt Erickson took over as the manager for the 2011 season. The Timber Rattlers stayed in the playoff race during the first half, but were eliminated in the final days. In the second half, the team struggled and missed the playoffs for the sixth straight year. Future Brewer Tyler Thornburg had an incredible first half of the season as he went 7-0 with an ERA of 1.57 and 76 strikeouts in 68-2/3 innings pitched. Thornburg was one of four Timber Rattlers to be named to the Western Division All-Star squad. Austin Ross, Chris Dennis, and Mike Walker also appeared in the game. Dennis homered for the West in that game at Quad Cities. Milwaukee sent a few of their players to Grand Chute for rehabilitation assignments. Zach Braddock, Carlos Gomez, and Manny Parra all appeared in games for the Rattlers. Weather affected six of the scheduled seventy home games for the team, but fans were still turning out to see the Rattlers. The total attendance of 240,998 may have been down from the 2010 season, but the average attendance of 3,766 per game set another attendance record for the Timber Rattlers. 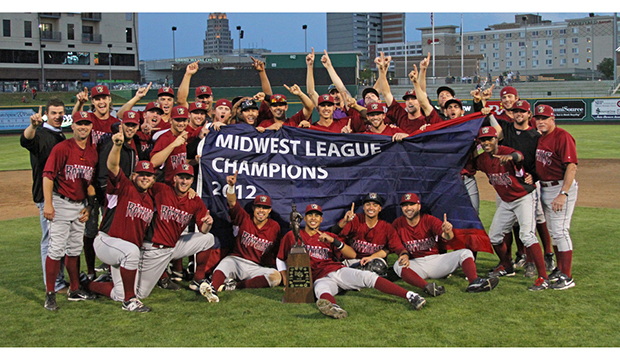 The 2012 season of the Wisconsin Timber Rattlers was one of the finest in Appleton Professional Baseball history. Wisconsin won the Midwest League pennant for the first time, the Front Office won the prestigious Larry MacPhail Promotional Award over all the other teams in minor league baseball, and a major renovation project to Fox Cities Stadium was announced. The team earned its first playoff spot since 2005 by winning the first half Western Division title with a record of 44-25. A 34-36 record in the second half meant the team ended the regular season with a 78-61 mark, the best in the West. The signs were there early for the Rattlers championship run. Chad Thompson and Mark Williams combined to no-hit the Clinton LumberKings on May 4. The team had ten walkoff victories at home during the regular season. A total of eight Timber Rattlers represented the Western Division at the 2013 All-Star Game in Kane County. The renovation project was announced on June 7, 2012. The centerpiece of the plan was the addition of a second level to the stadium that would include a year-round banquet facility, club seats, and six suites. The renovation also called for the expansion of the team store, team offices, restrooms, concession stands, and the home team clubhouse. Demolition would begin as soon as the season was complete. But, the Timber Rattlers players had plans to put that off for as long as possible. The team lost Game One of the first round at Burlington. Then, Chad Pierce and David Goforth pitched back-to-back complete game shutouts at home to eliminate the Bees. Wisconsin made quick work of Clinton in the second round with a two-game sweep to set up a date in the Championship Series against the Fort Wayne TinCaps. The teams split the two games at Fox Cities Stadium. The Rattlers won Game Three at Fort Wayne. Game Four was tied 2-2 with two outs and Nick Ramirez at the plate in the top of the seventh inning. Ramirez, who homered four times in the playoffs after hitting sixteen in the regular season, doubled to drive in a pair of runs and give the Rattlers a 4-2 lead. Brent Suter came on to relieve Thompson to start the bottom of the seventh and he retired the TinCaps in order. Suter also set the TinCaps down in order in the eighth and ninth innings and the Timber Rattlers celebrated their first ever Midwest League pennant! Minor League Baseball kept the honors coming for the Timber Rattlers when they announced the team had won the National Larry MacPhail Award. The award symbolizes the top promotional effort in MiLB. The effort of the team and the front office brought in 240,509 fans during the regular season and another 5,242 in the postseason. 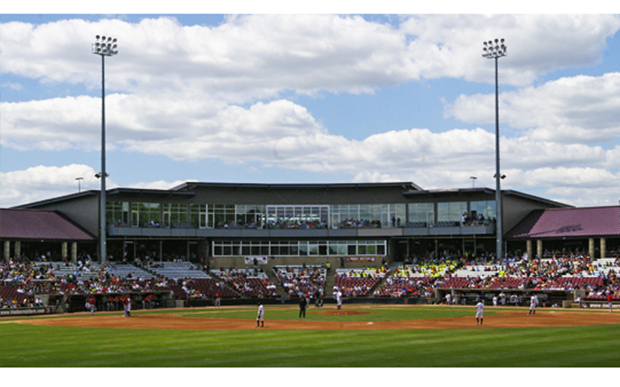 The renovated Fox Cities Stadium opened for the public on April 8, 2013. It was a chilly night and the team lost to the Cedar Rapids Kernels, but the word went out, "You've got to see this place!" The weather did not cooperate. Home games that were scheduled for April 9, 10, 11, and 12 were all postponed due to rain, cold, or snow. A doubleheader against Kane County was played on April 13, a frigid Saturday afternoon. But, snow intruded once again to postpone another doubleheader against the Cougars on April 14. The Rattlers stumbled to a 29-36 record in the first half, but stayed in playoff contention all the way to the final week of the regular season before falling to a 30-40 record on the half to miss out on a chance to defend the 2012 Championship. The team ended the year with a record of 59-76. Victor Roache made a run at the single season home run record and ended up with 22 to tie the mark set by Khris Davis in 2010. Tyrone Taylor had an amazing month of June and was named the Milwaukee Brewers Minor League Player of the month by the organization. The Rattlers continued to be a strong draw at the gate with a season attendance of 241,938. There were a total of six home games lost to the weather during the 2013 season. This made the average attendance of 3,780, another franchise record for average attendance. The Wisconsin Timber Rattlers qualified for the playoffs for the tenth time in their history when they claimed the second half wild card spot in the Western Division by edging out both Peoria and Quad Cities by a game. Wisconsin's trip to the postseason was over when the Kane County Cougars swept the Rattlers in the first round. The series ended in a 13-inning game in Illinois and Kane County went on to win the pennant that year. For the second year in a row, a Timber Rattlers hitter took a run at Khris Davis's franchise home run record. Clint Coulter hit two homers at Beloit in the final game of the 2014 season to match the season total of 22 homers by Davis and Roache. Coulter would be named the Milwaukee Brewers Minor League Player of the Year for his performance during the season. The 2014 offense set a team record with seven grand slams. Taylor Brennan hit three home runs with the bases loaded to set an individual record for a Timber Rattler. Coulter hit two slams. Michael Ratterree and Sthervin Matos each hit grand slams during the season, too. Taylor Williams led the pitching staff with an 8-1 record, a 2.36ERA, and 112 strikeouts over 107 innings pitched before he received a late-season promotion. The Timber Rattlers made ESPN when Omar Garcia's diving catch in left-center field was chosen as the #1 play on SportsCenter's Top Plays for May 14. In the stands, the team withstood several bouts with bad-weather and seven home games that were rained out to draw over 250,000 fans. The team averaged 3,970 per game, another attendance record for the franchise. The Timber Rattlers suffered the most losses by a team in franchise history when they fell to a 50-89 record, but there were bright spots for the team. Catcher Carlos Leal hit .309 and was named an All-Star. Pitcher Cy Sneed also made the All-Star team with an ERA of 2.68 over his 15 games - 13 starts. Kodi Medeiros, Milwaukee's #1 pick in the 2014 draft, made one of the better Timber Rattlers debuts in team history. The lefty out of Hawaii made his first Midwest League start a memorable one in front of 5,954 fans at the home opener on April 12. Medeiros pitched six innings of no-hit ball with seven strikeouts and one walk before leaving due to reaching his pitch count. Cody Ponce, the Brewers second round pick in the 2015 draft, joined the team and went 2-1 with three saves and a 2.15 ERA in twelve games. Blake Allemand, who was taken in the fifth round of the 2015 draft by the Brewers, reached base safely in 21 straight games from August 11 through September 2. That matched Tucker Neuhaus, who had a 21-game on-base streak earlier in the season. Wisconsin's attendance nearly reached 250,000 again with 247,577 fans turning out to support the Rattlers. The Timber Rattlers returned to the playoffs by claiming the second half wild card with a win on the second-to-last day of the season. The Timber Rattlers were in third place and trailed Burlington by three games in the wild card standings with just under three weeks left in the season. Wisconsin went 13-6 over the final 19 games to pass Quad Cities and Burlington to get into the playoffs. Wisconsin's trip back to the post season ended after a first-round loss to the Cedar Rapids Kernels in a two-game sweep. The pitching staff made history as they set a Midwest League record for strikeouts in a season. Wisconsin pitchers combined to whiff 1,294 opposing hitters to break the record that had been held by the Dayton Dragons (1,292) since 2011. Jordan Yamamoto led the Rattlers in strikeouts (and finished second in the Midwest League in that category) with 154Ks during the season. Closer Nate Griep became the new record-holder for the team in saves. The Grim Grieper had 23 saves in 2016 to break the old mark of 19 that was set by John Thompson in 1995. Isan Diaz was the offensive catalyst for the majority of the season. Diaz, who was named the Milwaukee Brewers Minor League Player of the Year in 2016, hit 20 homers and 34 doubles with 75 RBI to lead the team in all three categories. Diaz was one of EIGHT Rattlers to be named to the Western Division Midwest League All-Star team. Diaz, Max McDowell, and Jake Gatewood were named to the starting lineup. David Denson and Mitch Ghelfi were reserves for the squad. Pitchers David Burkhalter, Miguel Diaz and Marcos Diplan were also named to represent the Rattlers. Fans got to see some of the top 2016 draft picks by the Milwaukee Brewers. Corey Ray (1st Round), Lucas Erceg (2nd round), Corbin Burnes (4th round), and Zack Brown (5th round) all spent time with the Rattlers in the second half of the season. The team averaged 3,585 fans with just two rainouts during the 2016 season for a total attendance of 243,767. The Rattlers missed out on the playoffs as they were 64-73 for the season. The team was in the playoff hunt in the first half of the season, but they skidded to the finish line with a 10-game losing streak that dropped them from contention. This is the season that will be known as The Year of the Rehab. The Milwaukee Brewers assigned a total of nine players to the Timber Rattlers to help them rehabilitate from injuries. Ryan Braun, Jonathan Villar, Jett Bandy, Eric Sogard, Andrew Susac, Eric Vogt, Chase Anderson, Matt Garza, Adrian Houser, and Brent Suter all reported to the Timber Rattlers for duty. Braun and Villar were with the team over the first weekend of the second half of 2017. The doubleheader on June 23 drew 5,045 fans, Star Wars Night on June 24 had 6,288 fans in attendance to witness a homer run by Braun, and the Sunday afternoon game on June 25 had 5,156 fans come out to see the final game of the Major League duo. Monte Harrison had a big first half for the Timber Rattlers before earning a promotion. The outfielder hit eleven homers, stole eleven bases, drove in 32 runs, and was named to the starting outfield for the West Division at the MWL All-Star Game. Harrison would hit a pair of homers at the All-Star Game and was selected as the game's MVP! Catcher Mario Feliciano and pitcher Braden Webb also represented the Timber Rattlers at the All-Star Game. Feliciano was the starting catcher and Webb picked up the win in relief for the West. Keston Hiura, the #1 pick of the Brewers in the 2017 draft, joined the Timber Ratters for the final month of the season and played in 27 games. He hit .333 and drove in 15 runs in his brief cameo with the Rattlers.